A delegation of ten education professionals from Tajikistan will spend three weeks in Virginia meeting with their professional peers in the academic, government, and non-profit sectors. The goal of their program is to study best practices in teaching primary grade reading, especially in settings where resources are limited. An assessment of literary skills in Central Asia showed declining literacy and poor reading outcomes in the early grades, especially in Tajikistan. USAID initiated a new, four-year project, the Quality Reading Project, to improve reading skills among primary grade students. The Project aims to improve reading levels among students in grades 1-4 through the improvement of standards and assessment; improved reading instruction; better availability and quality of reading materials; increased out-of-school reading time; and increased government support for quality reading instruction. To allow hands-on experience gained by the participants to be directly applied in improving the quality of teaching and training. 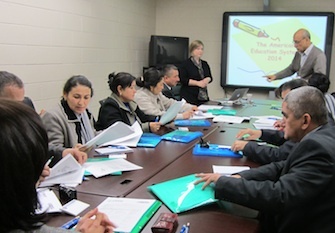 Learn more: Tajik Educators seek expertise in reading from faculty at Radford University. To continue efforts to disseminate best practices in their local communities in Tajikistan. Participants in Legacy‘s Community Connections delegation will have demonstrated strong leadership, team-work and communication skills and indicated interest in learning about American culture and best practices, along with a strong desire and commitment to introduce positive changes in their home communities. Delegates have at least three years of experience in primary education management or teacher training. Bio info on Delegates arriving in US. Community Connections, managed by the Bureau for Europe & Eurasia at the U.S. Agency for International Development (USAID) and administered by World Learning, is designed to promote public diplomacy through the exchange of cultural ideas and values among participants, U.S. families, and local community host organizations. It seeks to establish and strengthen links between U.S. communities and communities in Tajikistan.